You may not be very avid follower of Cricket……… but do read this article to know of the other perspective. 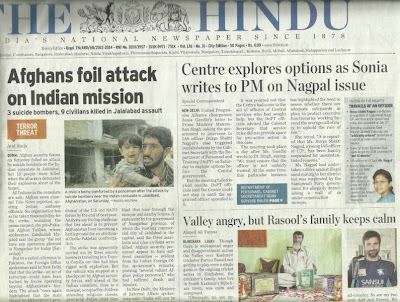 Today’ s The Hindu on its first page has this article titled “Valley angry, but Rasool’s family keeps calm’……… a cricket news – be it an Indian win or anything else has place on the sports column… but why such news on its 1st page – is it of such great National relevance…. A player getting selected happens or other happens in a process ~ there have been so many talented players who could never don the National cap …. Should a player be selected just because he comes from a particular region … or we trying to have ‘a quota / reservation based on region ?’….. for those who used to say that only those from Bombay, Delhi, Karnataka make it to the National scene – MS Dhoni is a shining example hailing from Jharkhand and rising high to lead the National side on all formats. 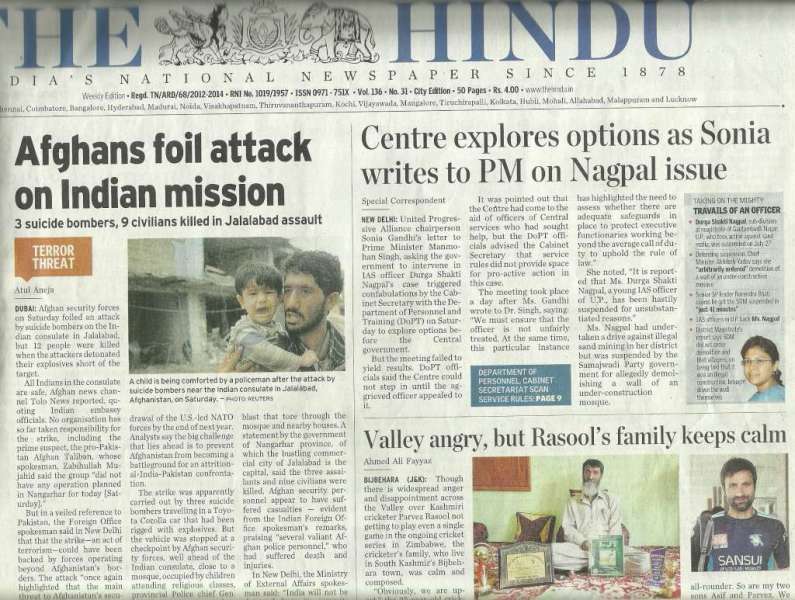 The Hindu report opens ‘Though there is widespread anger and disappointment across the Valley over Kashmiri cricketer Parvez Rasool not getting to play even a single game in the ongoing cricket series in Zimbabwe, the cricketer’s family, who live in South Kashmir’s Bijbehara town, was calm and composed.’ Parvez Rasool is a great talent – recently when Aussies toured India, he took 7 for 45 for the Board President's XI on a pitch that offered the slow bowlers assistance. Before you read further, here are some historical facts…………. Sunil Gavaskar listed 31 idols in his book ”Idols”published in 1983. Left arm spinner Rajinder Goel figured in the elite group. Goel took a record 640 wickets in the Ranji Trophy but never played any game for India save the unofficial Test against Sri Lanka. In that great era of famous Indian spin quarter of Bedi, Prasanna, Chandra and Venkat – Dilip Doshi who regularly excelled in England league could consider himself in getting break at 32 years of age. Goel almost played against West Indies in 1974-75 when Bedi was dropped… that Series was to see the ignominy of the captain of Delhi Test Venkatraghavan unceremoniously dropped for the next. There were few more…. Rajinder Singh Hans, a quality left-arm orthodox took 340 first-class wickets at 22, most of them for Uttar Pradesh. Padmakar Shivalkar had 589 first class wickets – enabling Bombay winning Ranji so many times. They never played for India. “Obviously, we are upset,” the 25-year-old cricketer’s father, Ghulam Rasool, told The Hindu. “But we fully honour the decision of the team managers. They are the best judges to decide who should play and who shouldn’t. Had he played today, our dream would have come true. Everybody in Jammu and Kashmir would have felt honoured. But, we are a family of sportsmanship. We don’t get carried away by emotions. We are hopeful he will play an international one day for India.” The ambience outside, however, was melancholic. “A pall of gloom has descended on Bijbehara, and rest of Kashmir, when the people learnt that Parvez was denied even the last chance. This is being viewed as India’s injustice to a talented Kashmiri player,” said Shukat Ahmad Tak. To end there is another story of a classical stroke maker who was prolific in mid 1980s – made a double ton for Delhi against Karnataka too… that was Bhaskar Pillai ~ made more than 5000 runs in Ranji. In 1988 when New Zealand toured India, India won all the one dayers and were 4-0 up – for the final ODI at Jammu on 19th Dec 1988, India made some changes and Bhaskar was there ……….. perhaps a good innings could have gotten him a place in Indian line up……. Ironically the match was abandoned without a ball bowled due to rain. PS : the coloured portion reproduced from The Hindu.